People often only use sweet potatoes on holidays. Hopefully this sweet potato salad recipe will change your mind about that. The holiday version of sweet potatoes often includes topping with melted marshmallow - not that healthy! 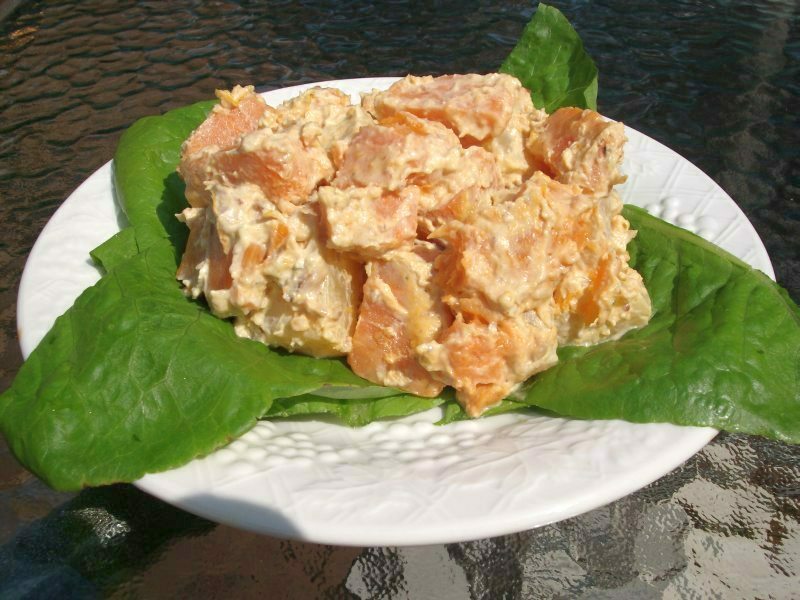 But a salad like this sweet potato salad, provides all the goodness of sweet potatoes without a lot of fat. Sweet potatoes are rich in dietary fiber as well as vitamin A, vitamin C and vitamin E. They also provide calcium, magnesium, potassium and folic acid. And if you want to talk about beta-carotene, I think sweet potatoes have got to be right up there with carrots! So, go ahead and make your sweet potatoes in a casserole or turn them into sweet potato fries or simply bake them and add butter and cinnamon. We'll usually take our like this - in a sweet potato salad. Yum! so they don't get too soft. pineapple, nuts and orange juice gently.